FILA Nationals pictures are here, for your viewing pleasure. It was an amazing scene, as I alluded to previously: two huge facilities with a total of 12 courts. There were positive and negatives, so I’ll touch on the positives first. At last week’s Michael T. White West tournament in California, a new player popped up on the Cal Sparks Gold team: 6-foot-2 Erica McCall. The soon-to-be sophomore had a decent showing that weekend, but had two breakout games Friday, as Gold played the two other toughest teams in the FILA Nationals tournament. Against the Lady Fire team of Chicago, McCall began pulling down improbable rebounds. She even dribbled the ball a little bit. Towards the end of the game she began scoring, and she continued this that evening, as the Sparks played the Jacksonville Lady Rams in the tournament semifinals. It was quite a display on a big stage – especially for a kid who isn’t quite yet 15 years old. Erica comes from an athletic family. 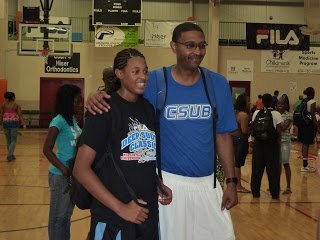 Her father, a former baller himself, is Greg McCall, who is assistant coach at Cal State Bakersfield. 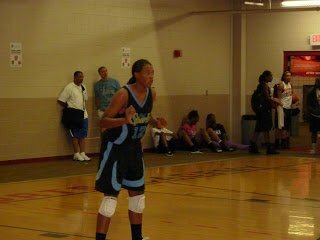 Her older sister is DeWanna Bonner of the Phoenix Mercury. Erica has a 10-year-old brother who competes nationally in track and field. Erica doesn’t talk much, so we will have to wait and see what else she can bring to the Cal Sparks team as most players will graduate next year. I have another story coming from the tournament which will be posted on hoopfeed.com. I have a story that will be posted in this space, and I will work on a story that may be posted on both sites. Erica McCall is ready under the basket in the second half of the FILA Nationals championship game Saturday afternoon. Erica and her dad, Greg McCall, who is assistant coach at Cal State Bakersfield, after the victory. I have to point out three key problems at the FILA Nationals tournament, in no particular order. 1. The use of the Dobbs Center. As mentioned, there is no air conditioning at this gym. In Georgia in late July, that’s unacceptable. The temperature was 90-100 in the gym, with humidity, and all they had was fans at six doors to blow hot air around. NCAA coaches were twittering their misery, and players were feeling it. I heard that three athletes passed out Friday. 2. The lack of trainers at this event. There was one trainer for the five-court gym at the Suwanee Sports Academy, and there was supposed to be one for the three-court gym, but I never saw anyone at the table. I saw coaches trying to run down trainers for injuries all day long. When the trainer was at the table, it wasn’t uncommon to see a line of girls waiting for a turn. And it didn’t matter if their team was playing at the time; the trainer just loafed along. Get more trainers when there are 152 teams present. 3. The officiating at this tournament was done by refs in training. I’ve seen this done before, but never on a national stage like this. There is no place for ref training at a major NCAA event – especially given the officiating I saw this past week. Horrible would be too kind of a word to describe it. Atrocious, abominable, reprehensible and asinine would only begin to cover some of the instances I observed. Do not use training refs at a major national tournament. Finally, just a notation: “They’re Playing Basketball” covers any and all events, whether or not they’re Nike-sponsored. I don’t care who’s sponsoring a game or a tournament – I just want to see good basketball. Great article. I know Erica and her family well. I just wish you would have included her mother, Sonya Mitchell-McCall who was a stand out 1/4 miler at Northern Arizona University. I believe Erica gets her hops and speed from her mother. Keep Erica on your radar as she is not only an athletic prowess but a bright student. Erica's dad happened to be there, and I don't believe her mother was, hence the picture. It seems that both parents have some great DNA; I'm envious. ACC: will a wild ride lead to an unforeseen ending?